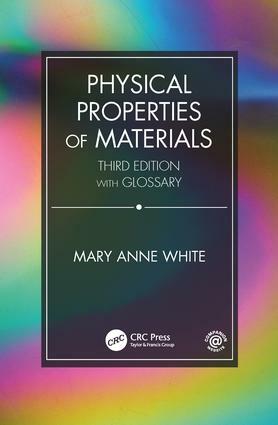 In this completely revised and updated third edition, Mary Anne White presents a thorough background to understand physical properties of materials from an atomic-level perspective. New aspects in the third edition include learning objectives for each chapter and a glossary of more than 500 terms, along with the information on the newest discoveries in materials science. This edition contains more than 50 new end-of-chapter problems, bringing the total to over 350 problems. This companion website from CRC Press provides updates to the further reading sections, including links to relevant websites, and ca. 30 videos made specifically for this book. Solutions manual available upon qualifying course adoption. This book stands out as a unique resource for students and established scientists working at the modern materials/chemistry/technology interface. It conveys a tremendous amount of information and distills the physics and chemistry down to an intuitive level that can be appreciated by both developing scientists as well as more established scientists looking for a teaching aid/text or a tune-up in their own knowledge. … This new edition includes many new state-of-the-art topics that have emerged as major fields over the last decade including carbon nanotubes, quantum dots, and spintronics. … I defy the reader to not find many gems of insightful knowledge to enhance their understanding of the physical materials world. ​ I am very impressed with the text. This text provides wonderful coverage of many of the basic properties of materials that we care about as scientists and as engineers. Mary Anne White wrote one of the most engaging introductory texts on materials science … Professor White has now prepared an updated version of her book adding several new sections that feature some of the seminal recent research advances and a number of the materials topics that nowadays pose important social concerns. … this is an excellent book to base an introductory materials course on, or to read for pleasure by scientists in other fields who wish to riffle through an excellent survey of what materials science has become today. ... a concise but in-depth insight into the physical aspects of materials science ... White expertly deals with the theory of the physical properties of materials, and the book offers a succinct but comprehensive coverage of this area.